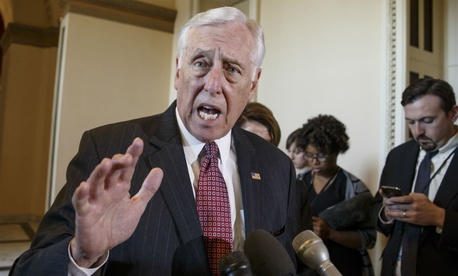 House Minority Whip Steny Hoyer, D-Md., said Wednesday that his Republican counterparts still do not have a consensus among their caucus on how to keep the federal government open past Friday’s deadline to avert a shutdown. Speaking to reporters, Hoyer expressed frustration with the lack of a clear plan from House Speaker Paul Ryan, R-Wis., and Senate Majority Leader Mitch McConnell, R-Ky., with only 48 hours remaining before federal workers are either furloughed or forced to work without pay. Ryan had planned to move forward with a plan to fund the Defense Department for the entirety of fiscal 2018, but enact a continuing resolution at current spending levels until Jan. 19 for other agencies. The bill also would have included $81 billion in additional funding for disaster relief efforts. If Congress does not increase defense and non-defense spending caps by late January, another round of sequestration will take effect as a result of the 2011 Budget Control Act. But Politico reported Tuesday night that Ryan’s plan, dubbed “Puntagon” by Democrats, had fallen apart. Instead, the House would bring forward a clean continuing resolution that runs until Jan. 19, and members would vote separately on bills providing disaster relief and to reauthorize some provisions of the Foreign Intelligence Surveillance Act. Hoyer on Wednesday offered another potential route Republicans could take: a clean four-week CR that reauthorizes a number of programs on a stopgap basis. Other Democratic lawmakers highlighted the steps they are taking to ensure that if a shutdown does occur, federal employees will be made whole after the government reopens. Sen. Ben Cardin, D-Md., has introduced the Federal Employee Fair Treatment Act (S.861), which would ensure that in the event of a shutdown, federal workers would be given back pay once funding is restored. Reps. Don Beyer, D-Va., and Rob Wittman, R-Va., have introduced similar legislation in the House. Although ahead of the last government shutdown in 2013, officials in the Obama administration had been in contact with federal employee unions about furlough plans and to hear concerns about issues like backpay, J. David Cox, national president of the American Federation of Government Employees, said they have not heard from the White House in recent days. AFGE policy director Jacque Simon said that although she knows the Office of Personnel Management has been in touch with agencies frequently over the last several weeks about updating plans for a shutdown, she has heard from neither OPM nor the Office of Management and Budget.